In the year 2089, archeologists Elizabeth Shaw (Noomi Rapace) and Charlie Holloway (Logan Marshall-Green) make a startling discovery. The couple uncovers a star map which seems to lead to a mysterious Alien race on a far off moon. They believe the map to be an invitation, and become obsessed with the idea of making contact with these strange beings. Elizabeth suspects they may be the architects of life on earth. Multibillionaire Peter Weyland (Guy Pearce) agrees to fund the expedition, which includes the construction of a scientific space vessel called the Prometheus. Four years later, the Prometheus finally completes its two year journey across the galaxy. Its crew is awoken from stasis and given its mission. Upon touching down on the seemingly barren moon, they begin to explore a massive structure on its surface. Once inside, they encounter something wholly different than what expected, though no less amazing. Their awe soon turns into abject horror as the true intent of the Star map’s makers in revealed. 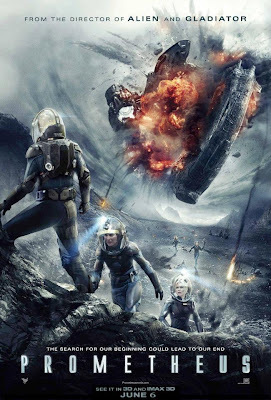 Instead of unearthing the origins of mankind, the crew of the Prometheus may very well have sealed its fate. As everyone surely knows by now, Prometheus is a prequel to Alien. It’s also a standalone science fiction epic meant to be the first of a trilogy. It tells its own story, and is not an Alien movie in the standard sense. While Xenomorphs and facehuggers are never shown, director Ridley Scott means to explore the origins of such creatures. He also means to probe a number of philosophical questions. Unfortunately, his reach ultimately exceeds his grasp. Ridley Scott is first and foremost a visual stylist. Even his worst films are usually quite beautiful to look at. Prometheus is no exception. The images are startlingly crisp. The sight of the Prometheus penetrating the storm laden atmosphere of LV-223 is breathtaking. Billowing grey clouds roll in the background as though part of an animated matte painting. The production design of the “vase chamber” is neither as foreign nor as hypersexualized as that of Alien. It looks like a cross between an Alien civilization and an ancient earthbound one. That compromise helps ground the story in a certain reality. It’s clear that Ridley Scott has given considerable thought to the look of this film. Unfortunately, the same can’t be said for its story. The screenplay, by Jon Spaihts and Damon Lindelof, fails to provide coherent explanations for much of what transpires onscreen. Things happen inexplicably, yet matter-of-factly. The characters are woefully underwritten. Some are initially cautious, yet suddenly become bold and overly adventurous. Others are miraculously able to interact with alien technology despite never having encountered it before. Meredith Vickers is clearly meant to be a stand in for Sigorney Weaver’s character. Two scenes featuring her echo similar moments from Alien. Unfortunately, like everything else in Prometheus, they function on a mostly superficial level. Prometheus owes perhaps even more to Stanley Kubrick’s 2001 than to Alien, though it lacks the ambition of either. The film raises a number of challenging questions that it can’t be bothered answer. Is it possible for science to debunk religion? If so, would mankind be foolish for maintaining religious faith in the face of irrefutable evidence to the contrary? What if the God that so many humans worship is revealed to be both malevolent and wantonly destructive? What then? In a braver and more intelligently written film, such questions could provide the basis for a truly enthralling sci-fi epic. Here, they merely play like an arousing tease. The film’s unfulfilled potential is doubly frustrating in light of its more tangible assets. The set pieces and sight gags elicit a visceral response despite the ineptitude of the storytelling. They provide both great visuals and palpable tension. The sight of living and animate engineers (formerly known as Space Jockeys) is a marvel to behold. This film has a Hell of a lot going for it, yet still manages to be surprisingly less than the sum of its parts. Prometheus is all foreplay with no climax. Where Alien was deceptively complex, Prometheus is deceptively shallow. It’s also a much more problematic work than both Alien 3 or Alien Resurrection, either of which could be simply be written off as bad movies. Prometheus has too much going for it to dismiss it in such a way, yet it has too many problems to recommend it to anyone but the converted. Fans of the Alien films and ponderous sci-fi will find a lot to like. Everyone else will simply stare at the screen in a state of bemusement.